Sean Moore ’17SCE speaks with his adviser, Anne Nagle, SCE assistant dean, in a Harkins Hall classroom. When Sean Moore ’17SCE decided the time was right to pursue a college education, he knew the road to academic success might be long and difficult. But, he also knew achieving his dream of earning a bachelor’s degree would be well worth any hardship he might face along the way. Moore, 32, has earned a bachelor’s degree in liberal studies from the College’s School of Continuing Education and will receive his diploma at the Ninety-Ninth Commencement Exercises on Sunday, May 21. It’s an accomplishment that’s been 14 years in the making for the U.S. Army veteran and father of four. In 2003, during his senior year of high school, the Coventry, R.I., native — who was a member of the Junior ROTC program as a high school student — enlisted in the U.S. Army. 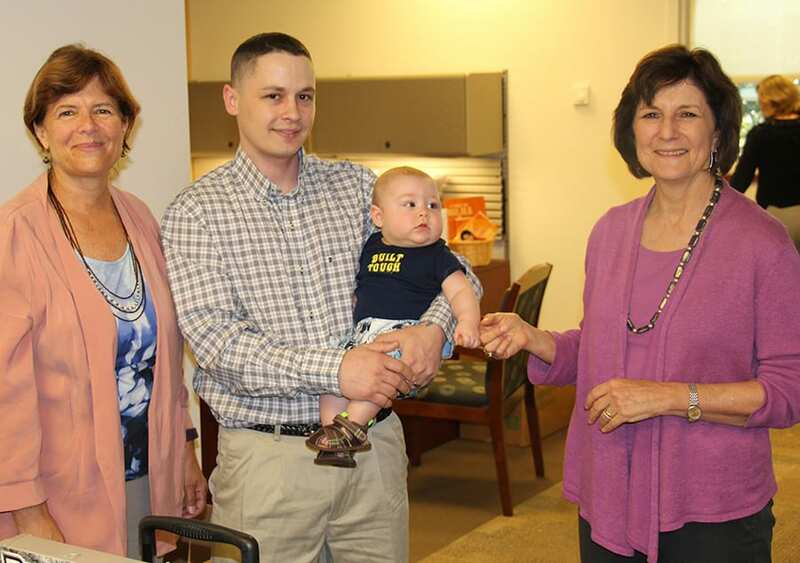 Sean Moore ’17SCE visits the SCE office with his son, Decklin. With him are Anne Nagle, SCE assistant dean, left, and Dr. Janet Castleman, SCE dean. His original aspiration was to be a helicopter pilot and mechanic. But, because he is colorblind that dream was not possible. However, when one path was closed to the young man, another opened, and Moore embarked on the first stages of the career he now calls his major professional goal. Focusing on finance, Moore reached the U.S. Army rank of E-4 specialist and became a financial specialist. His duties involved issuing soldiers their pay, and at one point that meant carrying cash in a backpack while serving in Afghanistan in 2004. Moore was discharged from active duty in 2007, though he served in the Rhode Island National Guard from 2007 to 2010. He set out to obtain a civilian job in finance but was counseled by potential employers that while he had the talent and skill for his ideal position — financial analyst — he lacked the essential requirement of a bachelor’s degree. “In the Army, I learned I was good with numbers. My goal was — is — to help people, specifically baby boomers who are getting ready for retirement, to help them plan and retire comfortably. The thing that stopped me from moving forward in finance when I left the Army was I didn’t have the education I needed,” he said. While working as a letter carrier for the U.S. Postal Service, Moore enrolled at the Community College of Rhode Island in 2009. Over the following six years, he earned his associate’s degree, and in 2015 he transferred to PC. He became a full-time student, taking classes in the evening in addition to working his full-time job. In August 2016, he decided to take an additional class per semester to graduate this year. “I put a lot of time and effort into this, sacrificing time with my family, but I realized that the sacrifice would pay off in the long run,” said Moore. Indeed, it has. Moore is graduating with a 3.64 GPA and is being inducted into Eta Lambda, PC’s chapter of the Alpha Sigma Lambda adult continuing education honor society. Induction into the society is reserved for the top 10 percent of eligible SCE students. Next up for Moore? In addition to choosing his “dream job” — he’s currently utilizing his college-learned networking skills to find the perfect fit — he’s planning his wedding and enjoying some well-earned time off with family — his fiancée, Tarah, and children, Ashton, 12, Angelus, 11, Lily, 6, and Decklin, 7 months. But he’s certainly not done pursuing his academic dreams. He’s looking forward to pursuing his master’s degree after taking some time off.